St. Llorenç de Montgai St. Llorenç de Montgai is a nice little crag with variative multi-pitch climbing on limestone and conglomerate in the northern Spain. There are also some single pitch routes (quite hard ones), but in my opinion multi-pitch routes are the main attraction there. 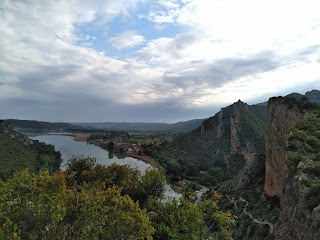 This post concentrates on the easiest climbs as the weather was so humid and hot when we visited St. Llorenç de Montgai, that there was no point trying to climb anything tougher. Montanejos is a well known crag and tourist attraction in southern Spain. If you're looking for a definitive climbing guide to Montanejos, you can stop reading now. I only have some general information to share, since we didn't climb anything there. Instead, we hiked around the hills and took a few dips in the not-so-hot springs. Despite all the tourists, Montanejos is a nice place to spend a few days just relaxing and resting your joints. The squirming road leading to and going through the village seems to be popular among cyclists as well. 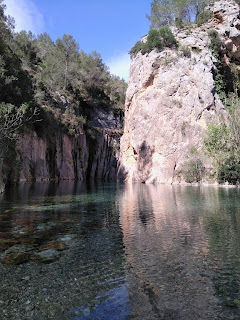 Montanejos is a small village located midst beautiful forest and hills just a few hours' drive from Valencia.